In a changing business climate, you're only productive as the technology that supports you. In fact, having the right services can mean the difference between one more happy sale or one less customer. Don’t settle for "one less" - get the right solution for your business with RCN Business Services. 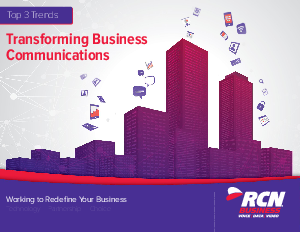 RCN Business Services offers a full suite of communications products and services to businesses of all sizes, including Internet, voice, video and network solutions. We are a facilities-based provider that offers extensive fiber density with redundancy and superior performance. Spanning over 6,000 miles, the advanced fiber-rich network is completely diverse from other communications providers, enabling businesses to experience exceptional customer service, quicker installation and issue resolution. RCN Business operates on three fundamental tenets: Partnership, Choice and Technology. These fundamental tenets guide how RCN Business approaches the sales process, addresses its customers, and supports its products and services. Partnership: The process starts with a dedicated RCN Business account representative actively listening and learning the needs, goals and challenges of a business. The trained and experienced RCN Business staff then delivers a customized solution. Choice: RCN Business understands that one size does not fit all. The goal is to create a reliable, customized technology solution that contributes to a business’s success and growth. Technology: Technology and customer support are critical to any business. With RCN Business owning and having full control of its network, businesses get local U.S. based operations, faster response times and a continuous monitoring for superior uptime.